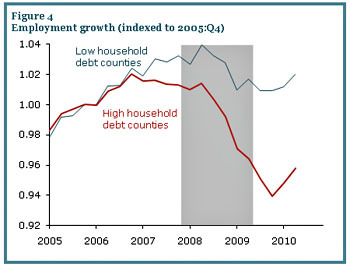 Overall, the county evidence strongly suggests that credit demand is weak because of an overleveraged household sector….The evidence is  consistent with the view that problems related to household balance sheets and house prices are the primary culprits of the weak economic recovery. King (1994) provides a detailed discussion of how differences in the marginal propensity to consume between borrowing and lending households can generate an aggregate downturn in an economy with high household leverage….Our view is that the depth and length of the current recession relative to previous recessions is closely linked to the tremendous rise in household debt that preceded it. This isn’t an easy problem to solve, but a couple of things leap out. First, high household debt is strongly correlated with underwater mortgages, and this could be partly addressed by a more aggressive program of loan modifications to replace the hapless HAMP program of 2009. Second, temporary tax cuts that put money in people’s pockets are useful even if the money doesn’t get spent. We won’t get a full recovery until debt levels get back to normal, and the faster that happens the better. If tax rebates get used to pay off credit cards or mortgages, that’s fine.